The idea isn’t as crazy as it may sound. What if there’s more to space and the universe than we are willing to even to consider? 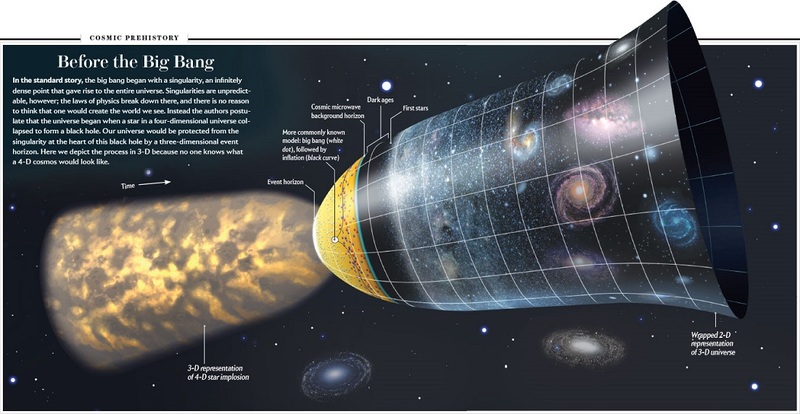 Looking back at the distant past of the universe, some 13.8 billion years ago we will reach a singularity: an incredibly dense, hot, energetic point where laws governing space-time breakdown. In other words, it’s a point where the laws governing our universe no longer apply. However, a singularity is also exactly what you find if you were to fly inside a black hole. Siegel explains that to the best of our understanding, the universe we live in is ruled by two points: quantum mechanics and general relativity. If we you go on and analyze it, black holes defy these rules since their event horizons –a boundary in space-time beyond which events cannot affect an outside observer— are much larger than can be explained by the behavior of the particles inside it.